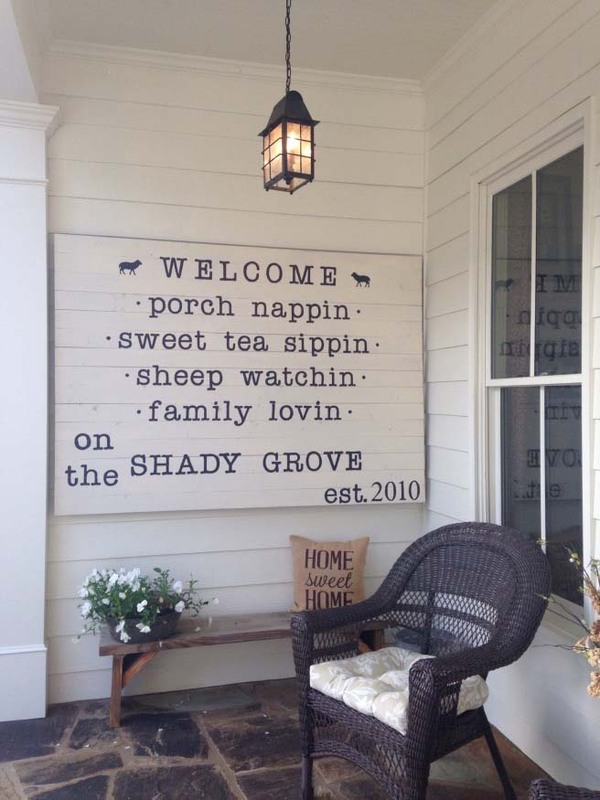 Every time I hear “porch”, I image a spacious, extended farmhouse front porch like the ones in the movies where people spend the hot summer days, drinking homemade lemonade and watching the sunset, like in the movie The Notebook. Don’t get upset if you don’t have a movie-sized porch budget. In fact, the front porch design also can be done nicely and stylishly without necessarily breaking the bank! Whether you paint a few pieces of old furniture and arrange a cute sitting area or buy all new decor, it just takes a little artistry and free time to design the perfect space for relaxation. 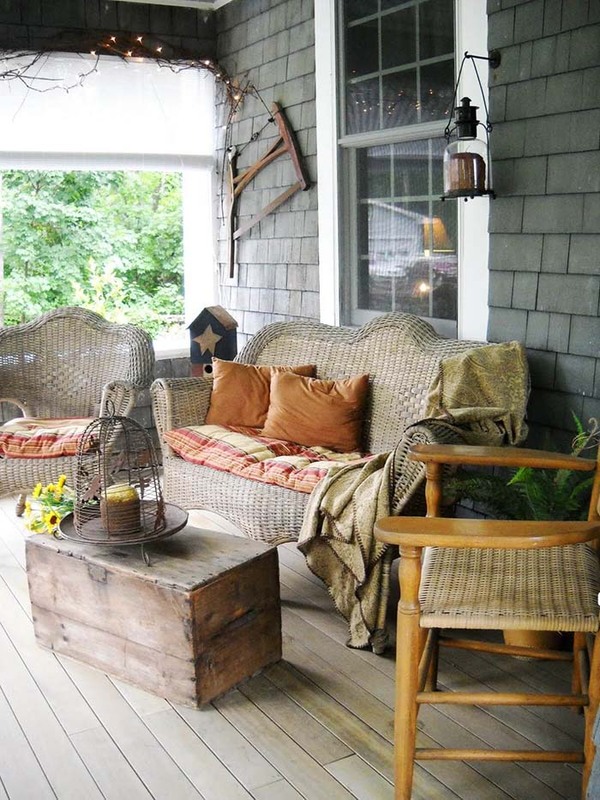 It doesn’t matter what is the size of your porch, tiny or big, it can still be appealing. I have prepared a collection of 50+ rustic farmhouse decor ideas to help you get inspired! Let’s take a look together! 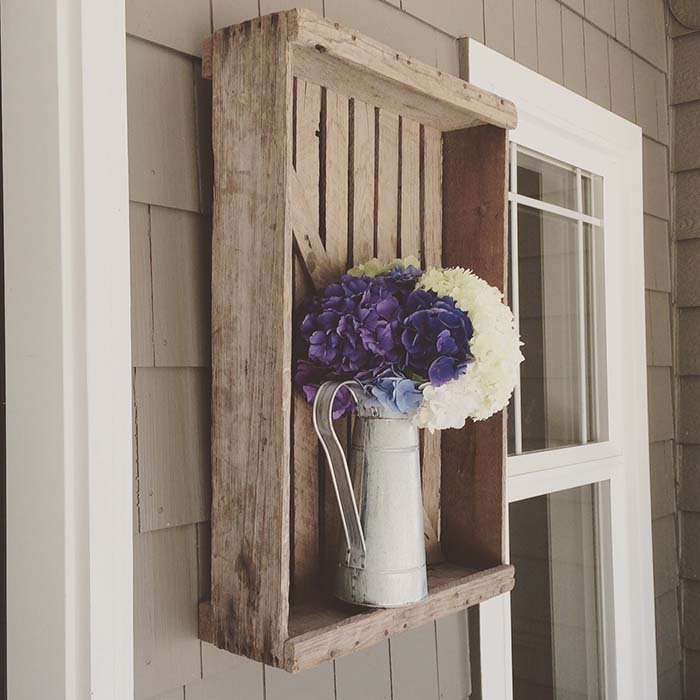 This rustic porch decor is amazing, easy to make, and affordable (as you are using elements you already have in the garage such as a vintage bike, basket with flowers and more). 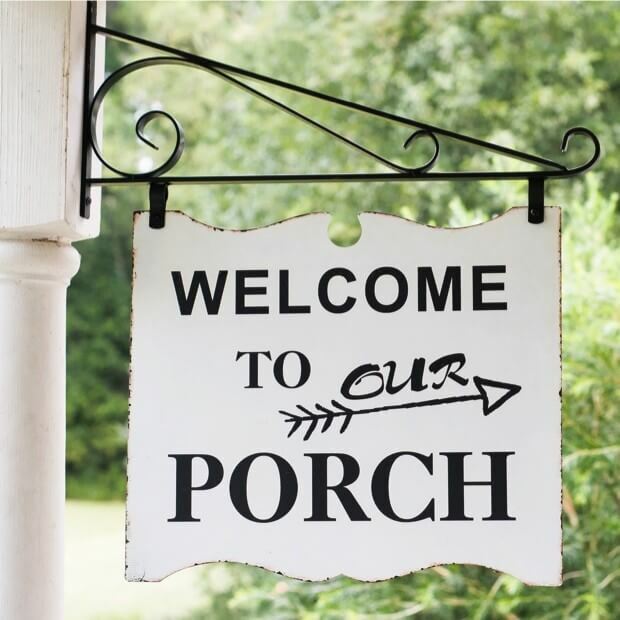 Moreover, it would help you keep the summer vibe on your front porch forever. The personalized wall decor is the ideal focal point for letting all your guests know what it is all about. The monochromatic palette makes the front porch space feel airy and breezy, while the wood give extra coziness and welcoming touch. Leaving an organically looking floor mat with a sign “Home sweet Home” is a classic way to make your friends and family welcomed in your house. 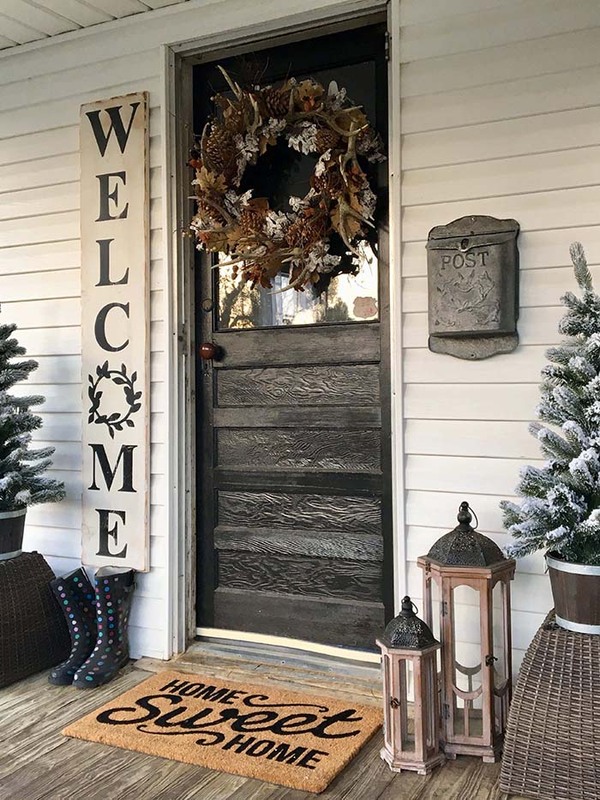 The large wreath on the door gives the space extra texture, while the big, vertically positioned wall sign “Welcome” compliment the design of this old farmhouse porch. 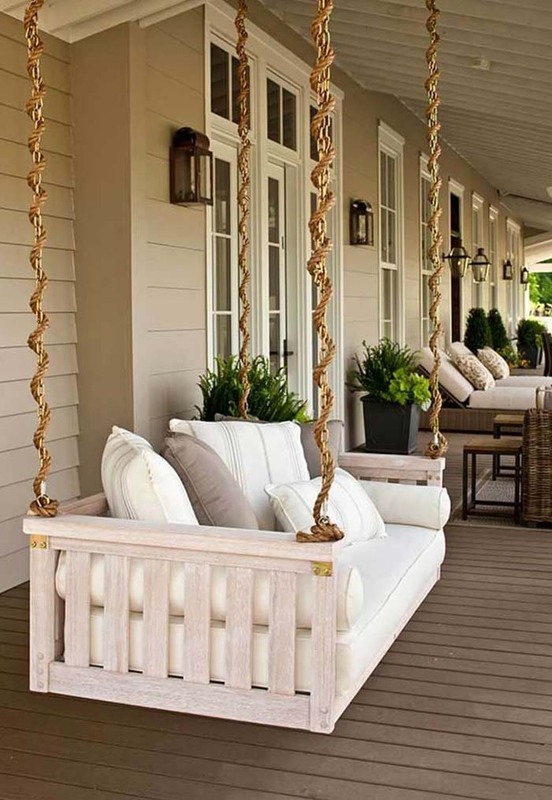 A couple of ropes wrapped around the supporting chains of a porch swing surely adds an embellishing vibe. The rustically chic, unpretentious floor and the natural elements make this farmhouse porch extra inviting. 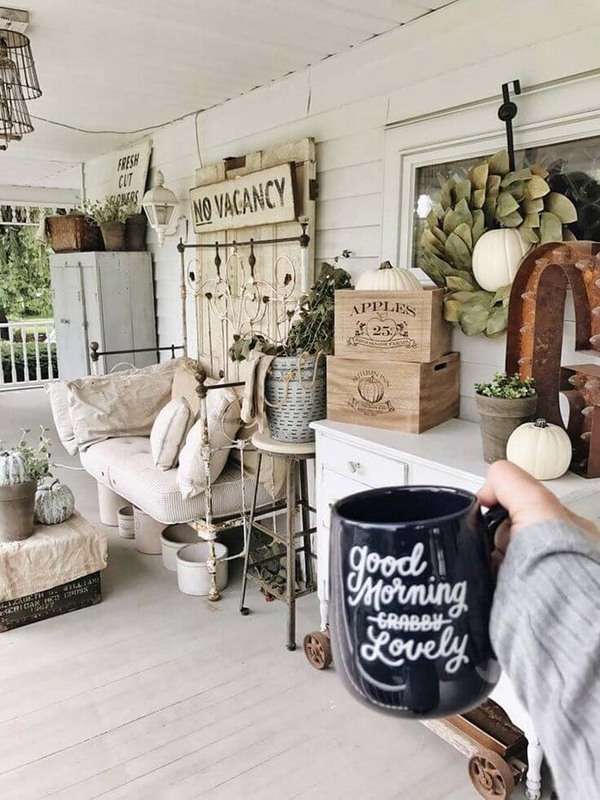 If you are a fan of the industrially rustic porches, make sure to display at least a few antique metal items and some greenery (as shown on the picture above). The red berries create a nice contrast with the plants. 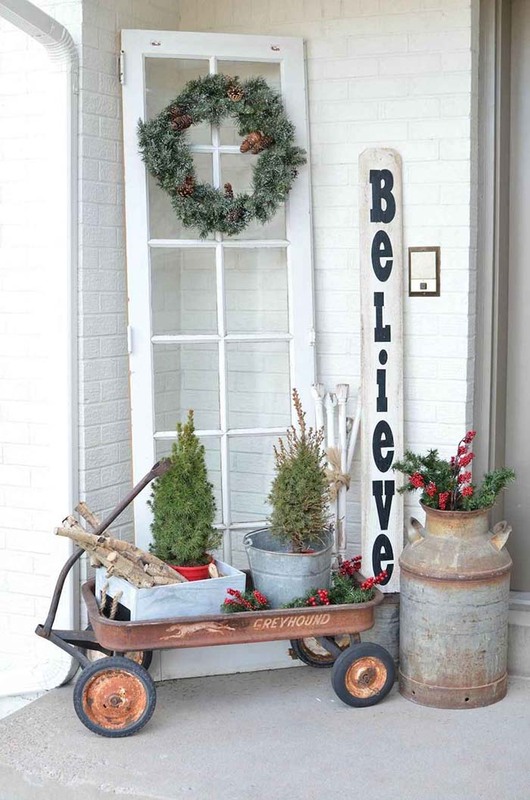 The wall decor “Believe” defers from the most common signs “Welcome” and helps this porch make a strong statement. 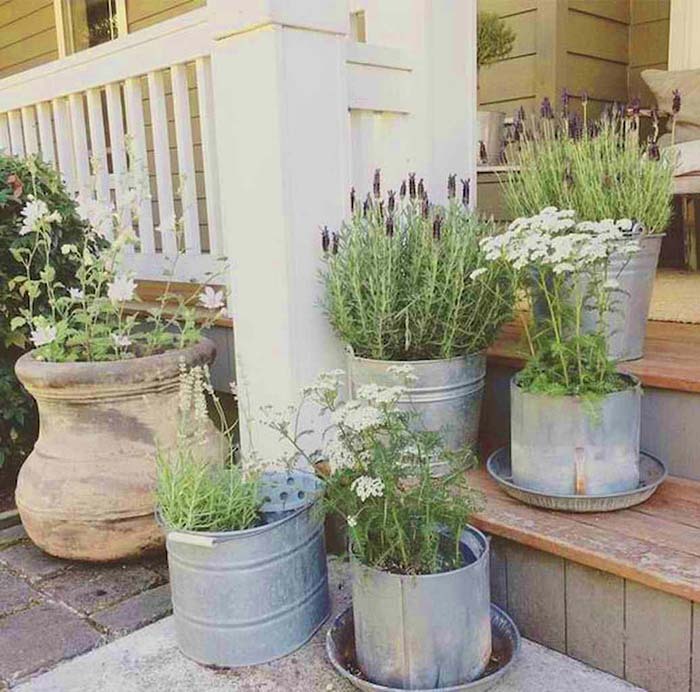 Planting herbs in recycled metal buckets and pie plates will surely give the porch a strong rustic charm. Arranging them on the steps lowers the sharp corners of the stairs, and offers a fragrant salute. Your friends and family won’t doubt their welcome when it’s signed largely as life. 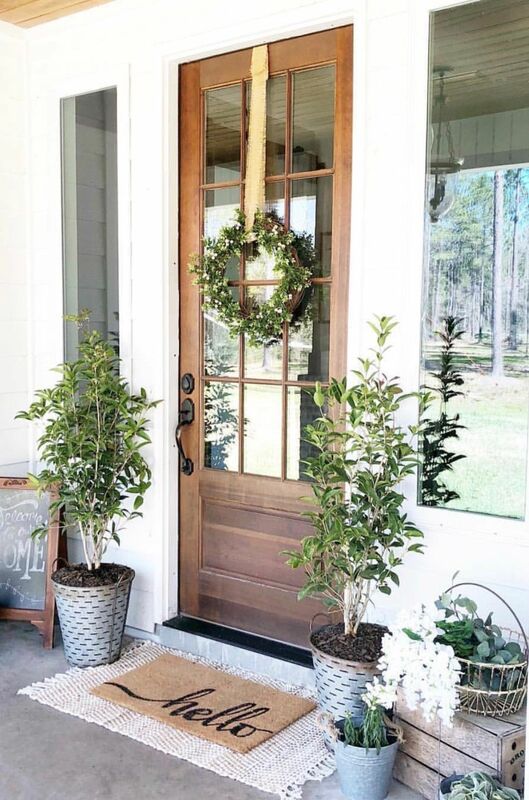 The simple elegance of the large potted greenery, combined with the glowing light of a single candle at its foot, make this front porch decor’s welcome inescapable. Remember – nothing should go to waste on a true farmhouse style home. The old wooden ladder and washboard-texture wall provide just the right scenery for colorful potted flowers and a collection of antiques. 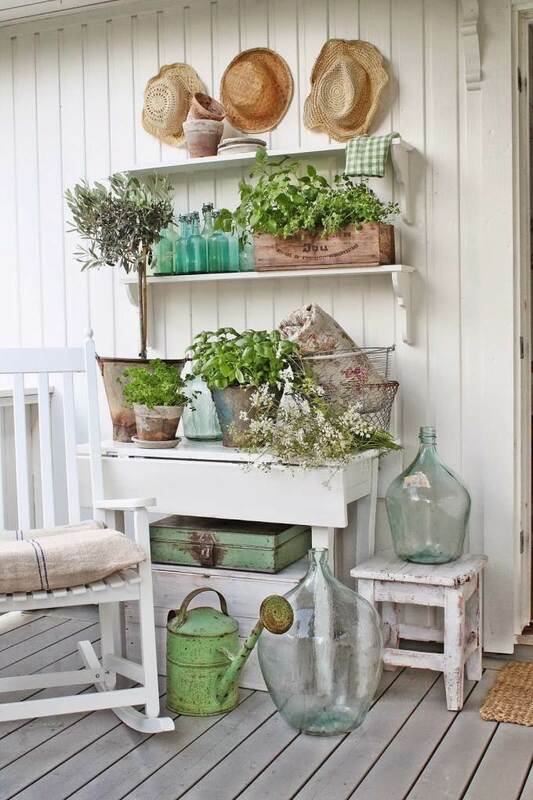 The pair of vintage wooden shelves over a drop-leaf table in the same color resembles a classic country dresser, displaying an abundance of pots and bottles for the resident gardener. 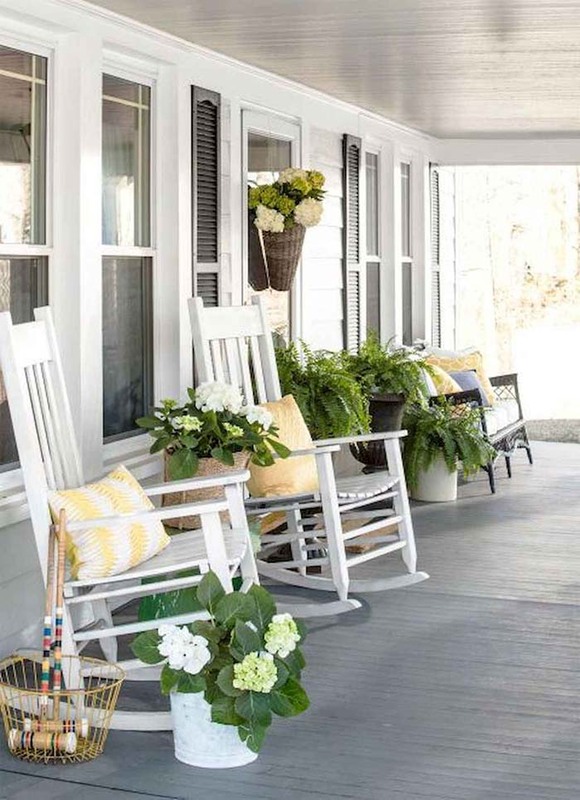 The trio of hats and the glass jugs are the final touch to this fun porch design. This back porch’s impressive barn wood floor and all-white walls embellish the charm of the reclaimed wooden cable spool. The cheery set of candles and lanterns makes it either a centerpiece or, a chic alternative to an outdoor campfire at night. 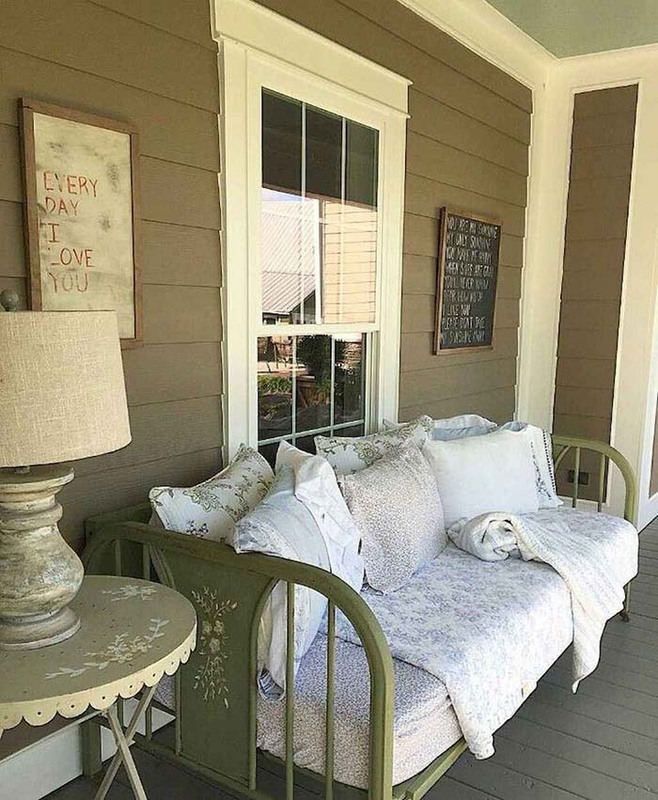 One of the easiest and ever-working tricks to make the porch cozier and more relaxing is by choosing only neutral colors. 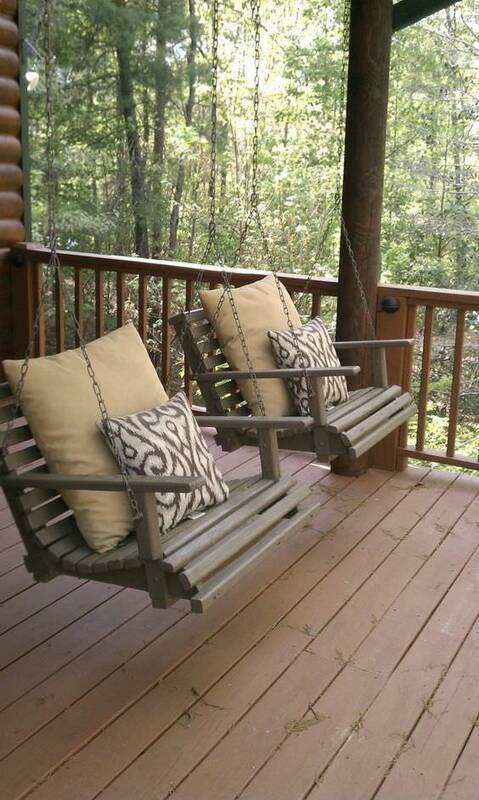 The duo of wooden swings ideally fits the floor and the surrounding forest, don’t you think? 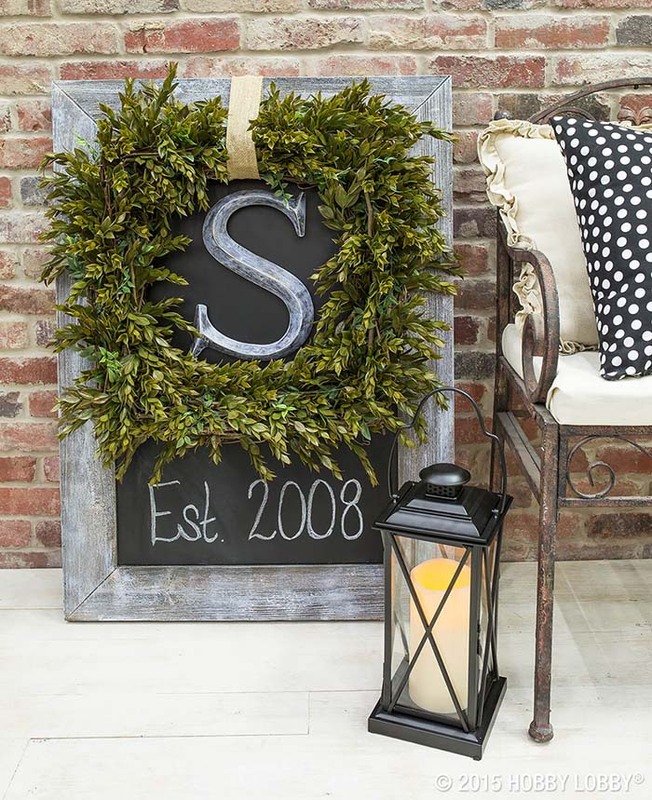 These large initials lose their frowst when carved in wood and painted in country chic colors. Showy and fixed by the front door, this one serves as an appealing and personalized frame for the numbers of the house. Why don’t you dress up your front door with a large DIY wreath entirely made out of fabrics and colorful faux florals? 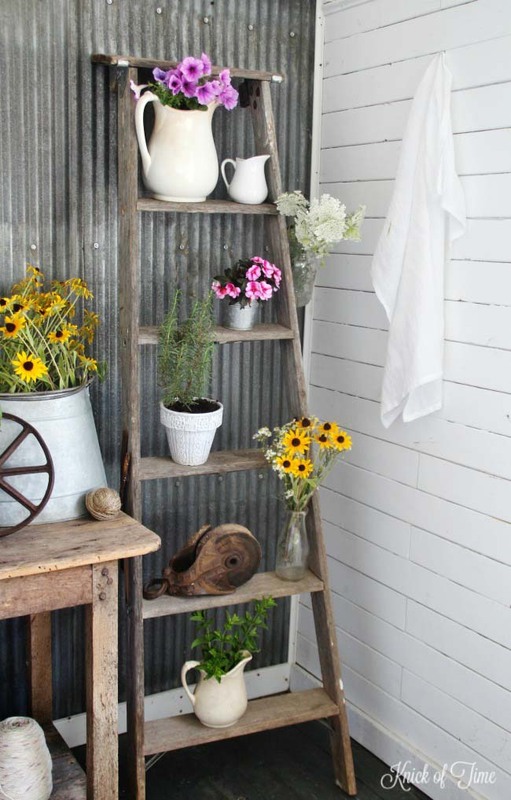 To enhance the farmhouse vibe of this country porch decor, display an old water can, a metal ladder, and a pair of gumboots planted with garden flowers. 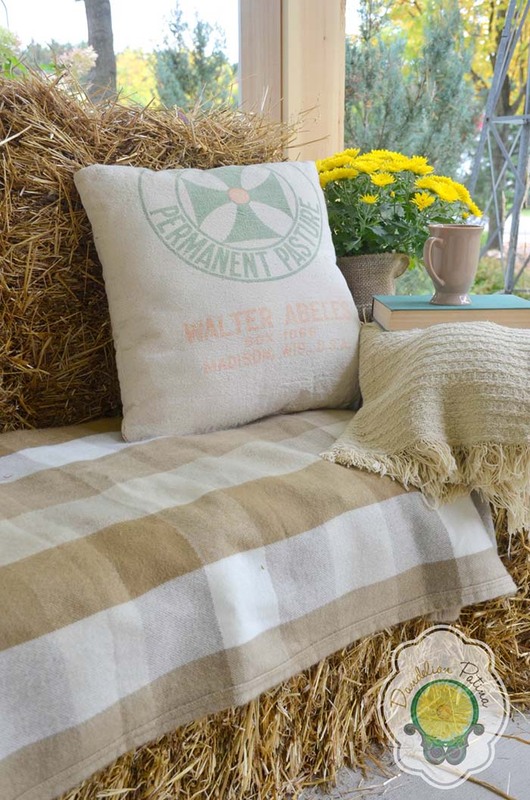 When you are searching for some farmhouse porch decorating ideas, try to keep it simple and effortless. 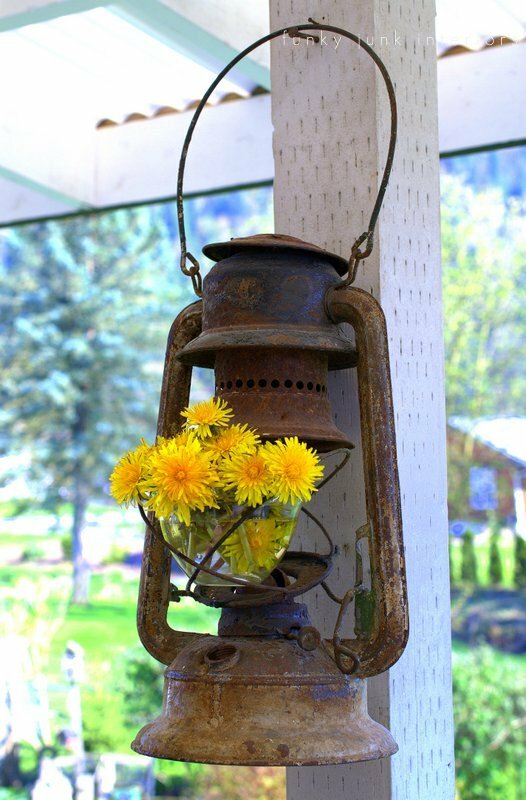 This old and rusty miner’s lantern, for instance, can lighten your porch when brags with a hand-picked bouquet of sunny yellow flowers. 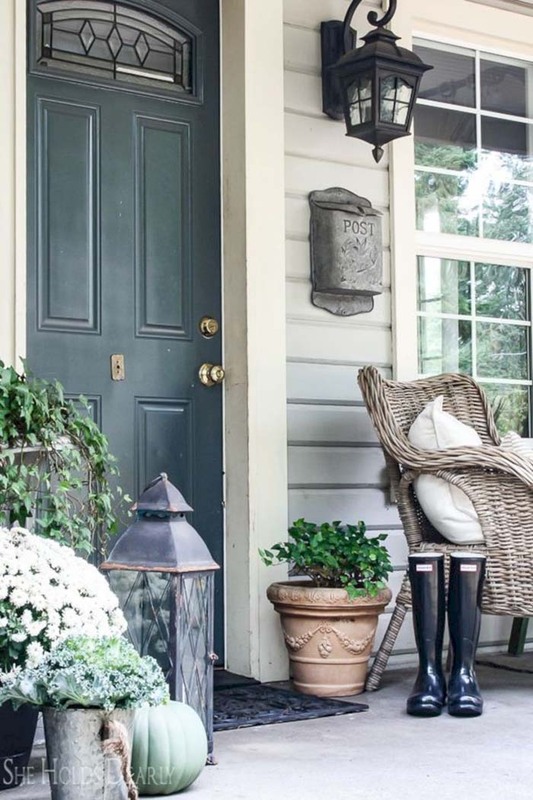 This project for a rustic front porch shows you don’t need too much space to bring on the ‘hygge’ (a Scandinavian word for a mood of coziness and comfortable). The decorative cushions, the faux potted flowers, the warm blanket make this little outdoor bench very appealing. 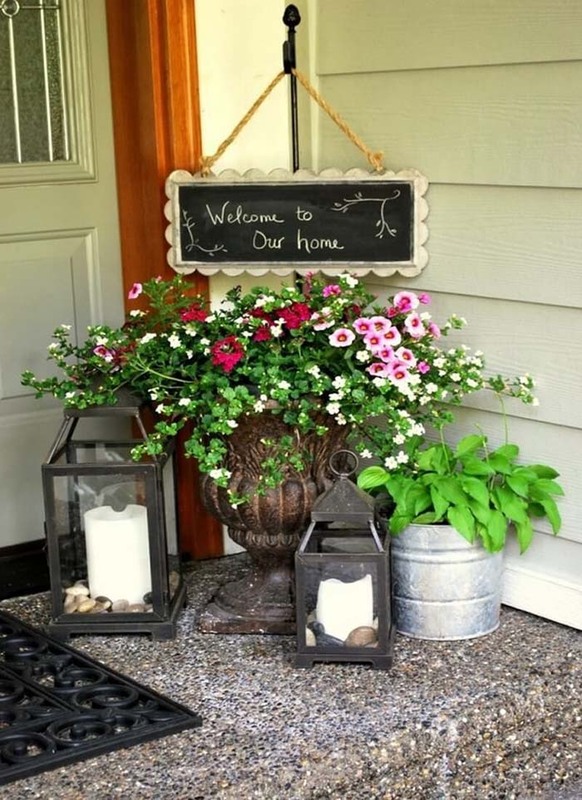 Displaying loads of flowers in rustic wooden boxes and hanging baskets on the porch is another simple and timeless decor idea it may be good to include in your list of farmhouse porch ideas. 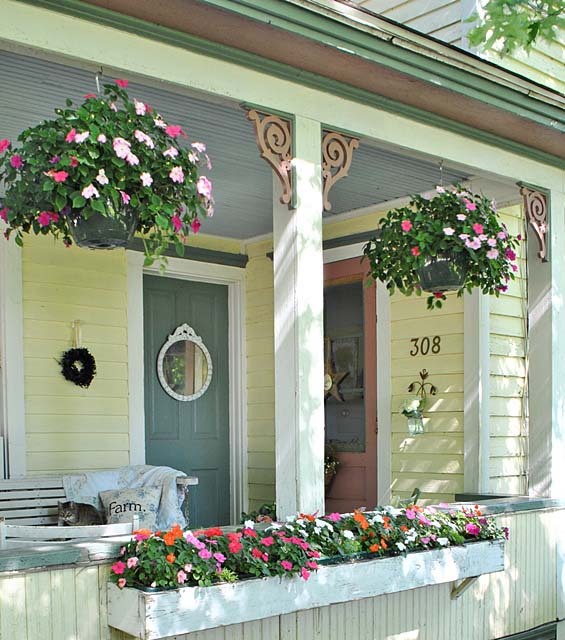 The colorful flowers add instant curbstone appeal without spending all your savings. 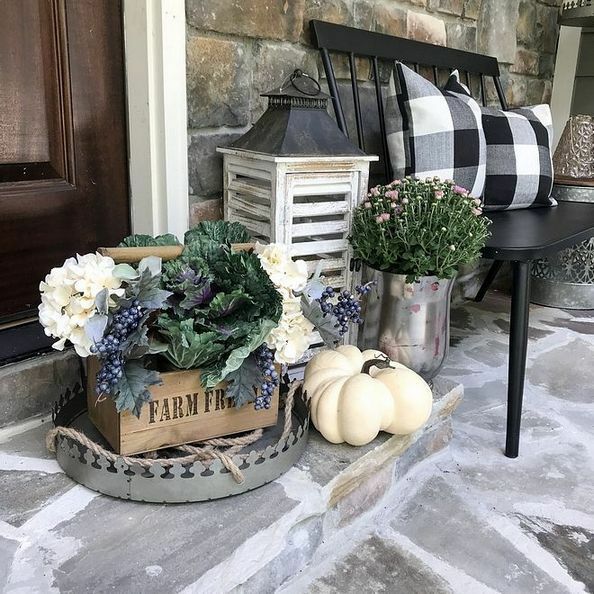 The simple, everyday objects like trays, cushions, vases, and lanterns give the porch space a homey vibe, while the fresh greenery and the pumpkin add just enough pinch of joy. Many people I know decide to freshen up the porch every year before the spring comes. Forced branches, spring flowers, herbs, and succulents fill all the pots and trays while the chalk board sends a cheerful message to the upcoming spring. 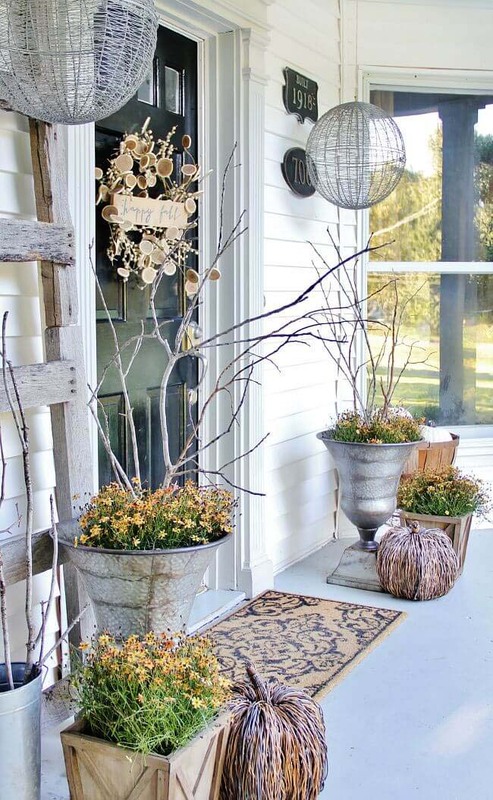 Metal elements and neutrals, fused with organic arrangements like these dried hydrangea blossoms in their undersized ceramic pot, give a lessen elegance to this porch. 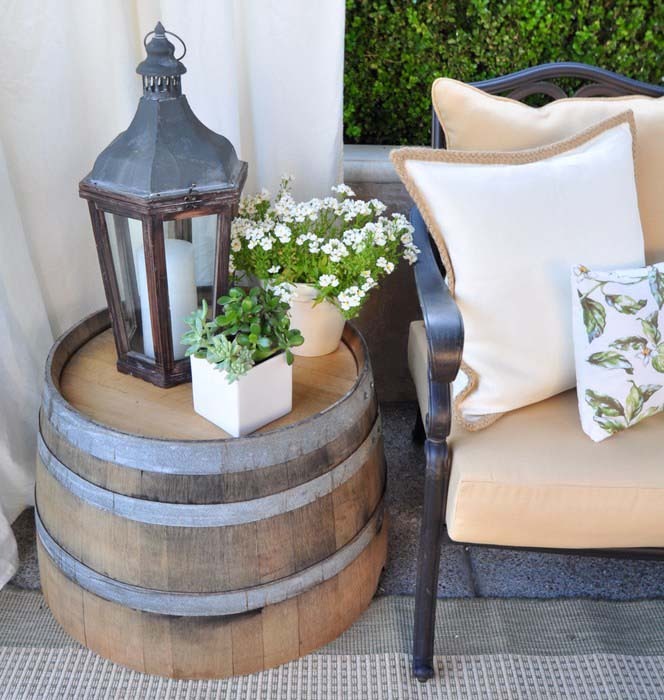 One of the easiest way to create a coffee table for farmhouse porches is to cut a mid-size wine barrel. Display an oversized lantern and some potted succulents for extra texture and warmth. This DIY mural is the ideal focal point for welcoming your friends and family members. The monochromatic wall decor helps the space feel more stylish and breezy. Dark-painted shutters combined with rocking chairs give out an overflowing piece of farmhouse welcome. 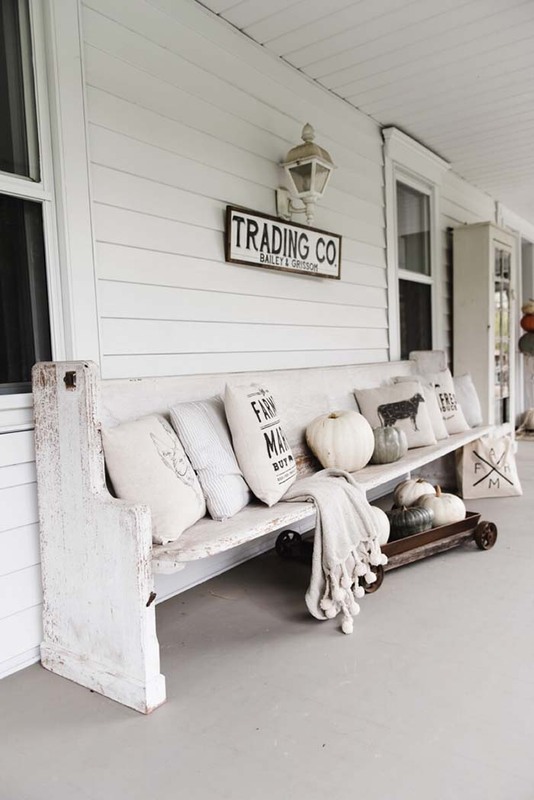 The plain spare space on this farmhouse porch brings an organic, warm, and homey elegance to its country home. 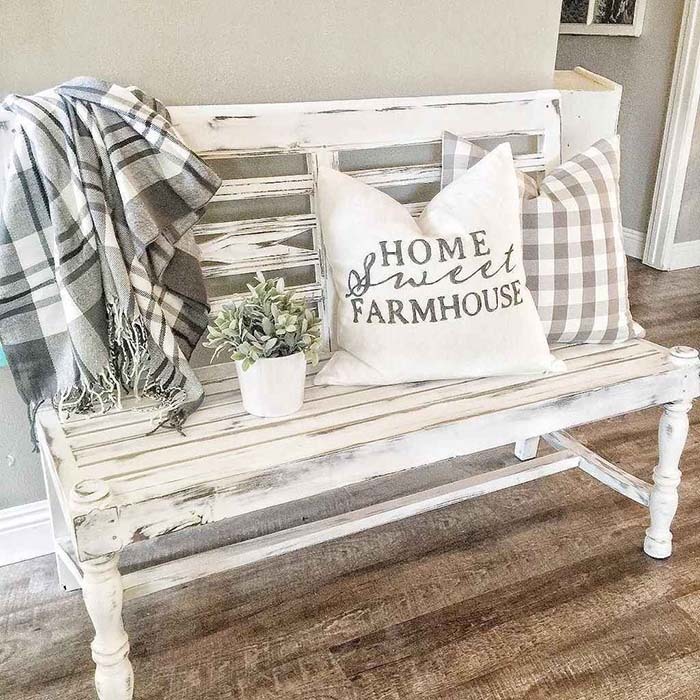 I am a big fan of the rustic front porch ideas that tell you how to use the old furniture and transform it into something beautiful instead of buying new, pricey one…like this bench! It is made-up with chalk paint in natural, timeless palette. 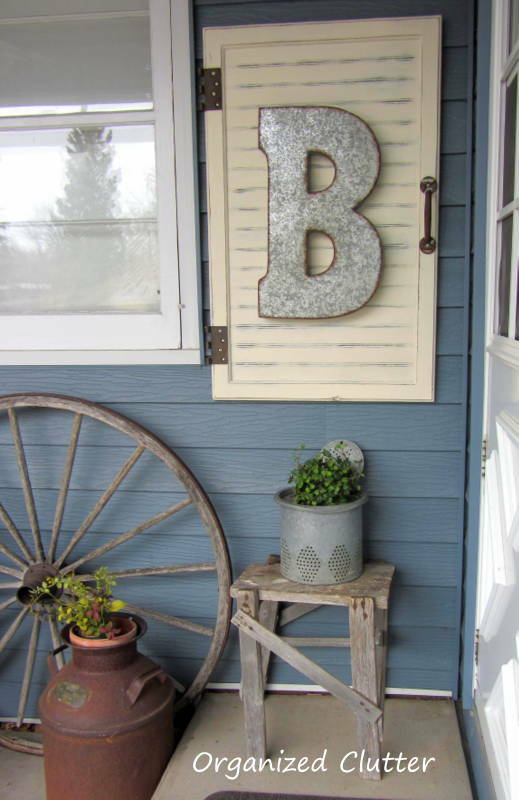 A rusty milk churn, scrap wood table, metal pot for flowers, and afflicted old cabinet door pair together in an inviting way to create this lovely rustic front porch decor, marked with the family’s monogram. 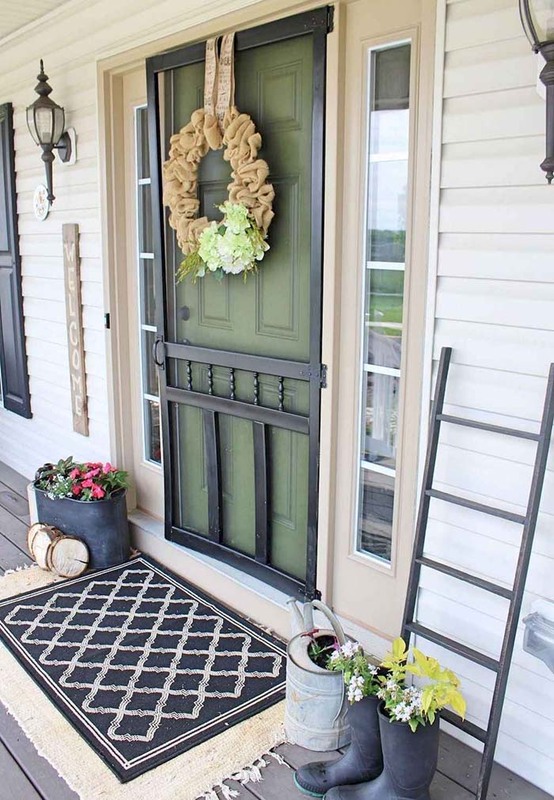 If you have this feeling of irritation every time you are having a cup of coffee on your front door porch, because it feels too small and choky, why don’t paint it all in white so it will feel more breezy, airy and open? This old wooden fruit tray fixed indirectly on the wall works as both shelf and rustically chic frame for the freshest and brightest blossoms from your seasonal garden. 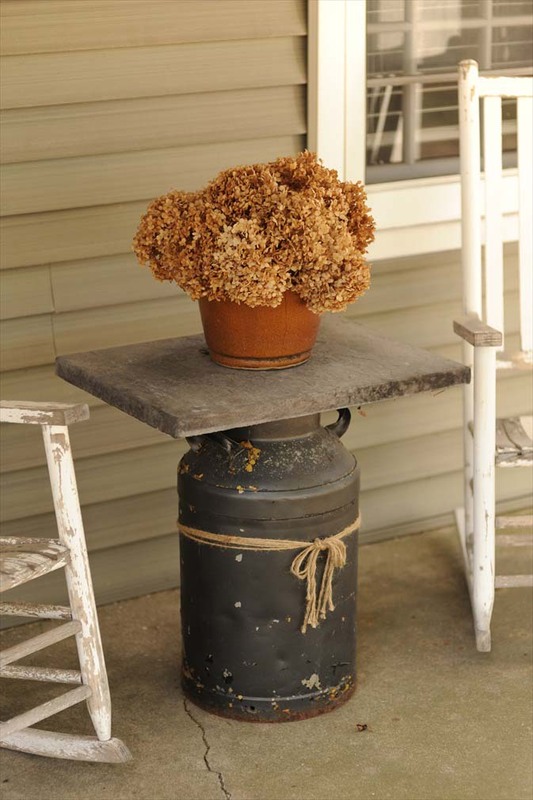 The flowers are arranged in an obsolete metal pitcher that enhances the farmhouse vibe. 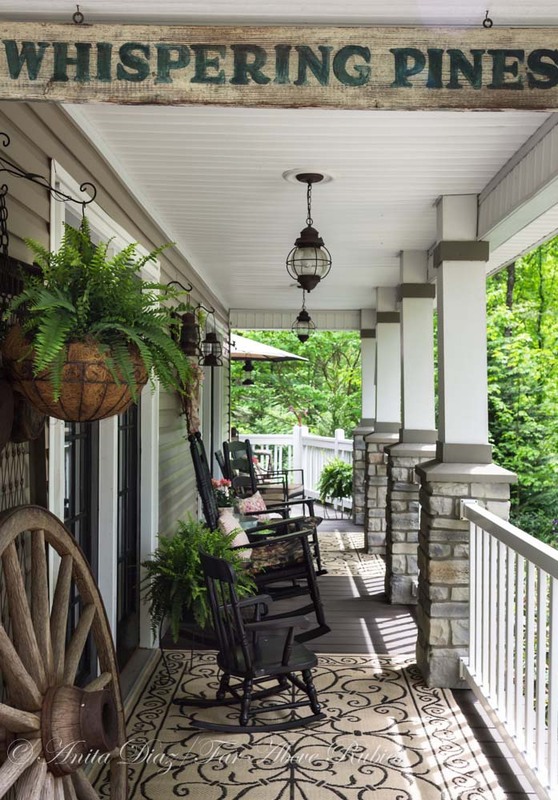 The decor of this high-ceiled porch is something that makes you smile everytime you look at it. The colors used are very bright and warm, implying for the upcoming summer. 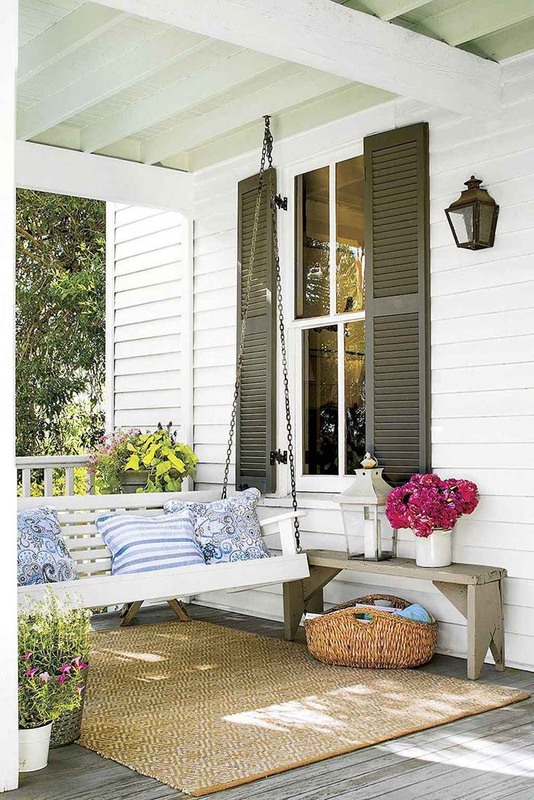 The old bench, transformed into a cozy swing, makes this porch decor a very conversational and eye-catching space. 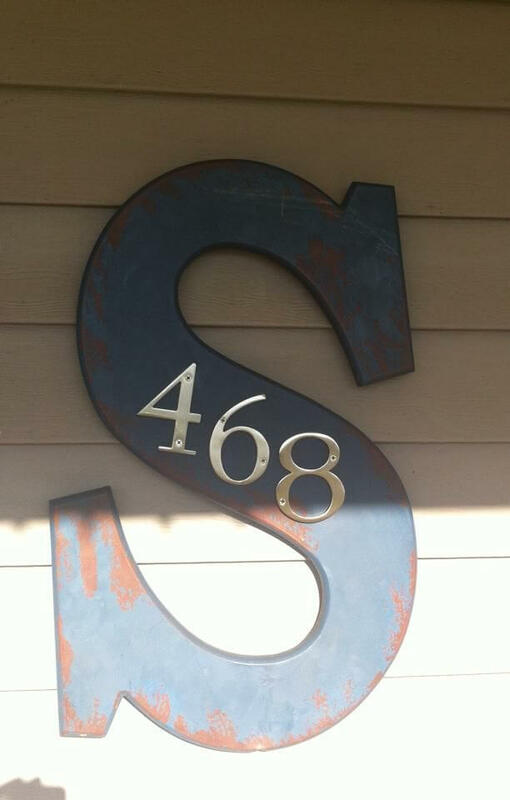 This hand-painted on a metal rusty board wooden sign hung from a black metal bracket will greet your neighbors to the family porch. Such an an artistic personal touch surely makes the outdoor living space extra welcoming and fun. 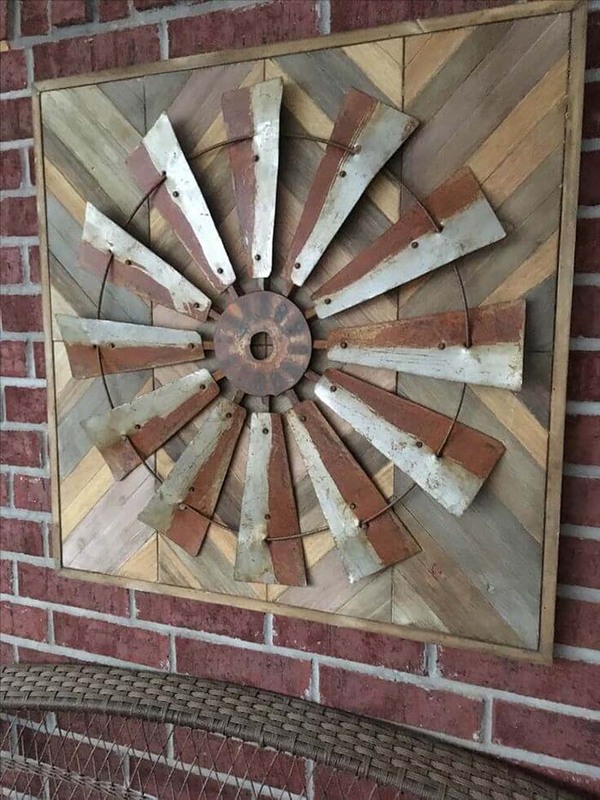 An aged windmill’s metal swords are given second life against herringbone wooden board and the red brick wall. The layers of textured rectangles makes a marvelous focal point, and puts a new spin on popular sunburst wall decorations. Here is a repurposed vintage single bed made into a comfortable outdoor coach for your rustic front porch. All elements of the decor come alluringly together under an integrated palette of neutrals and cream – the ideal to start the day. This family lettering, fixed in a simple photo frame, brings a nice industrial touch to this porch designed in farmhouse style. Besides, you would all agree with me that the distressed brick wall makes the whole space look unpretentious and timeless. This satisfying disorder encircling a tiny sofa in neutral colors and its adjoining vintage storage cupboards all comes charmingly together under a unified palette of neutrals and cream colors. Bouquets of soft lilac blooms overflow the reclaimed wood coffee table with color and fragrance. 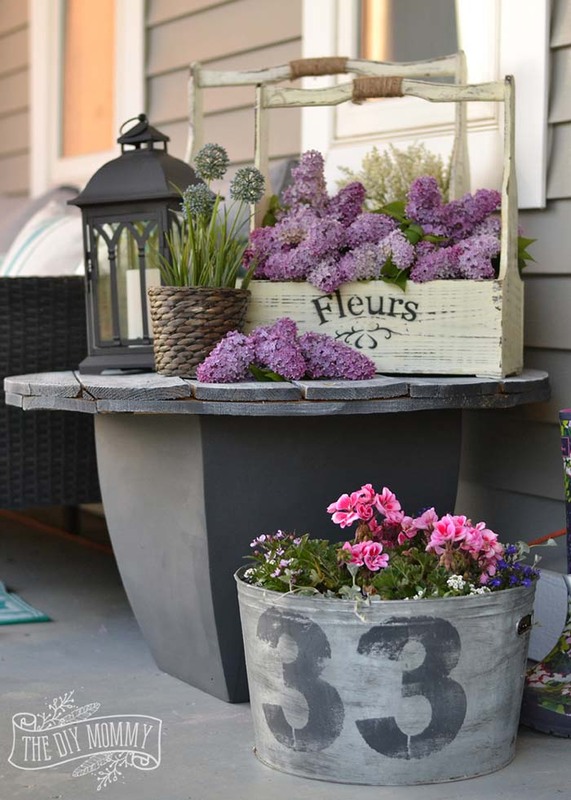 On the floor nearby, the repurposed tin bathtub made into flower planters offers a low-priced and artistic way to display the number of the house. This is one of my country porch decorations ideas, for sure! 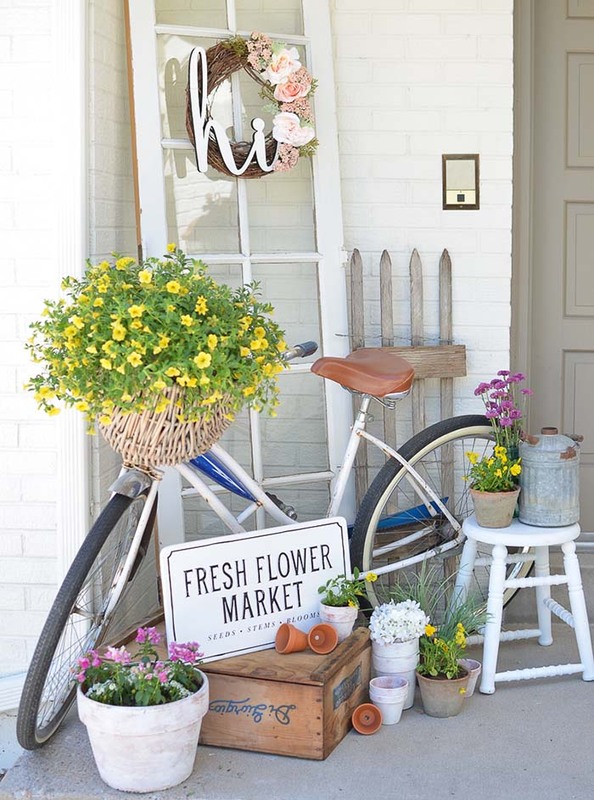 Pots, containers, kettles, old wooden boxes or rusty milk buckets – great objects to create beautifully upcycled flower holders for the entryway. They carry their own rustic style and charm, especially when illuminated from vintage carriage lanterns. 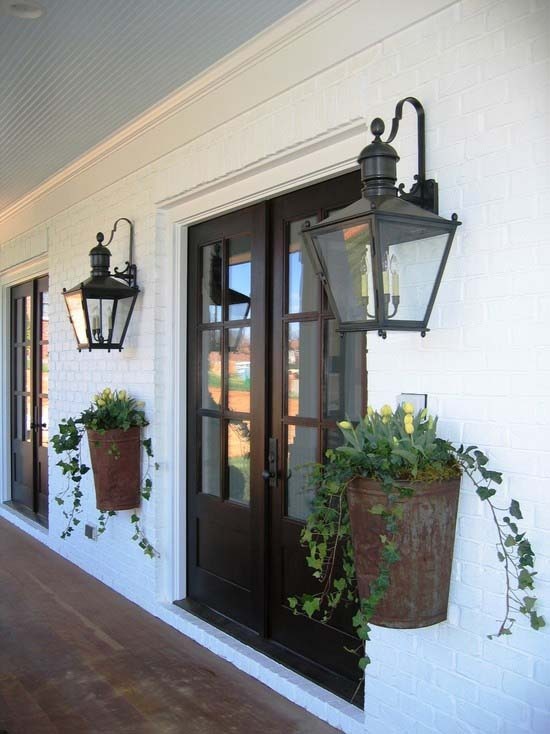 Delicate, pale potted flowers and oversized industrial lanterns lend a spacious feel to this bright, classic entryway. 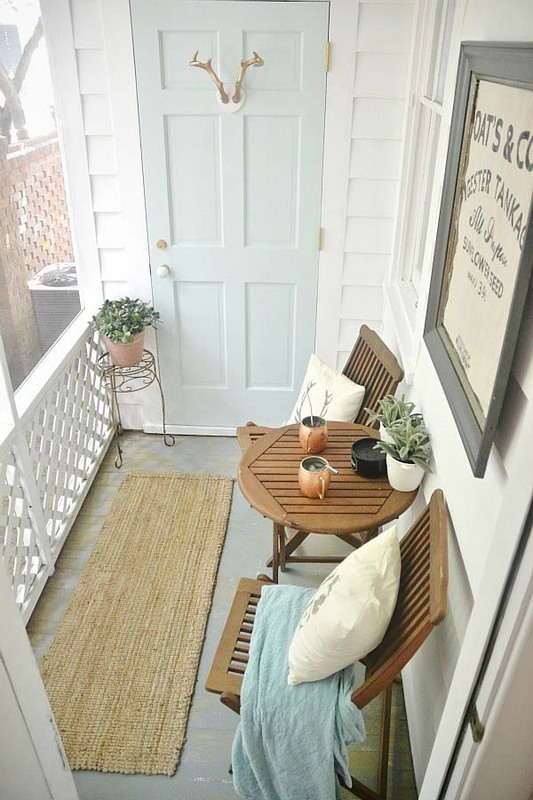 The vintage carrier lantern fixed on the wall and the cute sitting space warm up this porch and make it even more welcoming. 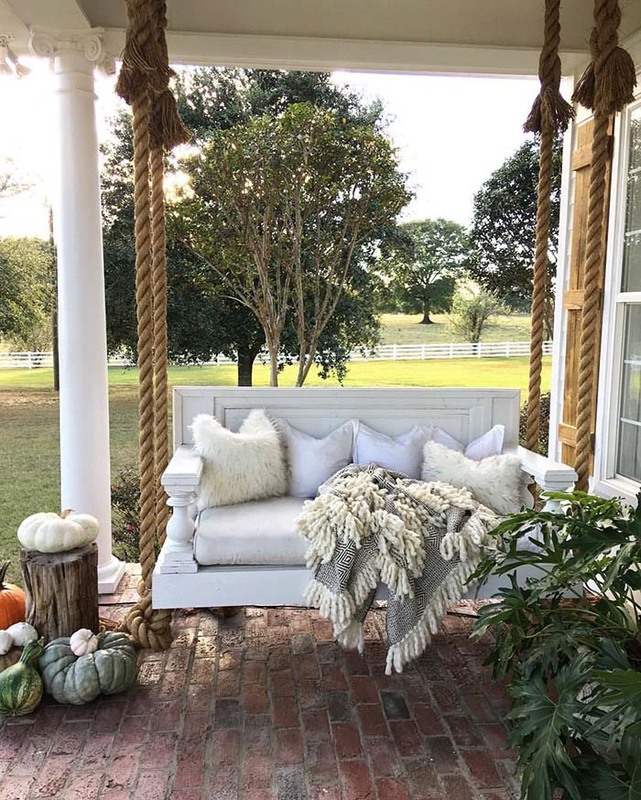 The heavy golden ropes and cozy pillows in neutral palette definitely add excitement and an attractive softness to this wooden DIY porch swing. Besides, it has been symmetrically arranged according to the rest of the decor which gives you a sense of inner harmony. 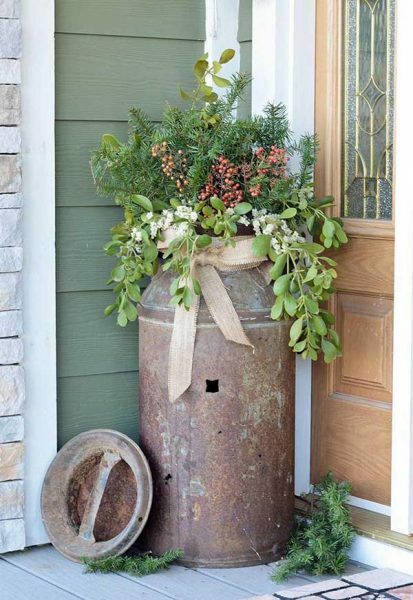 What better addition to this farmhouse style porch than an old, large, rusted milk pail that works as a chic vase for these fresh evergreens? It’s has the ideal amount of rustic sophistication and artistry, right? 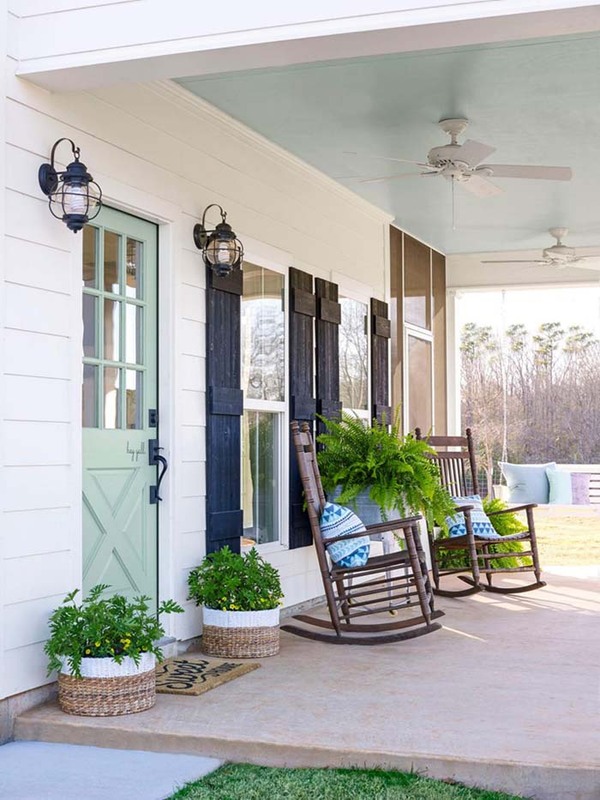 All repurposed details in this freshly re-painted front porch come together to tell us a fairy tale about a big Southern family who’s living in peace and happiness. The sunlight and the black rockers create a dramatic feel. 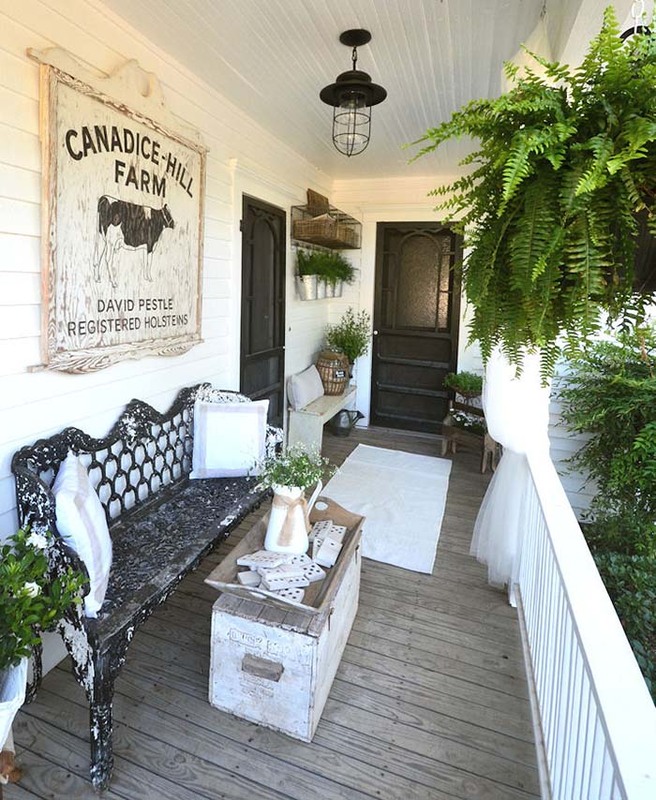 This simple and stylish combo of green ferns and white reclaimed wood turn this rustic Victorian porch into a summertime oasis. Everything is very inviting and makes you feel like home since the first minute. 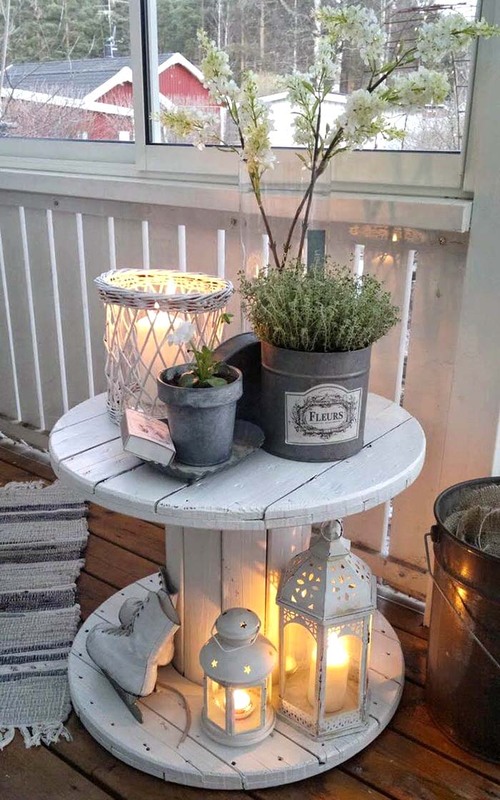 Here is a great idea for a country porch decorating with limited space. 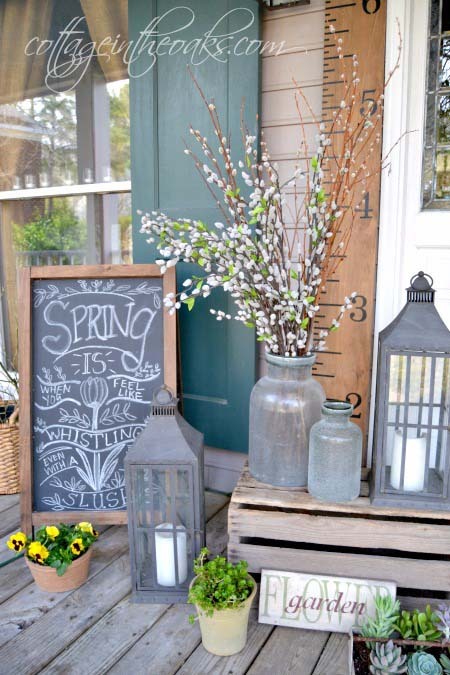 Make a fun arrangement with lanterns, potted seasonal florals, and welcoming sign on a chalk board. Customize it by your own choice. Wooden crates and soft textures in neutral palette form an inviting sitting corner on this farmhouse porch. The wreath entirely made out of fresh plants gives a spark of extra warmth. 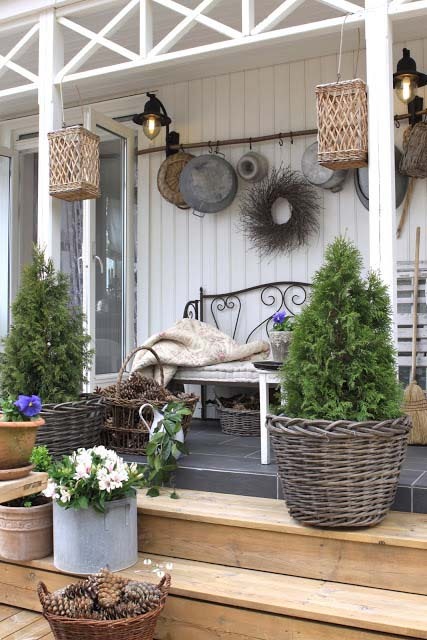 The cypress trees in pots and the large baskets filled with pine cones add just enough joyful touch to this lovely, woodsy porch decor. Besides, displaying everyday objects like pans and blankets, give the space a homey vibe. 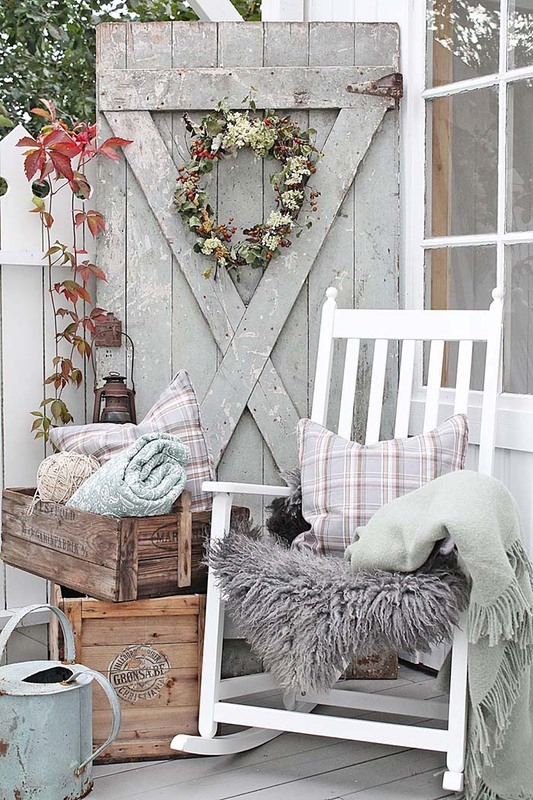 One of my favorite country porch decorating ideas are the ones which mix up soft and rough textures. Why? Because they look fun. bold and embelish the rustic charm. 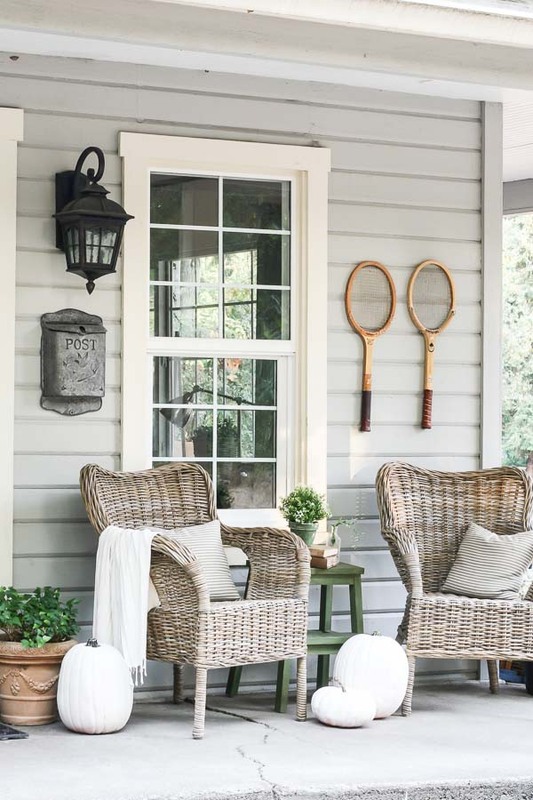 The old wooden elements and disheveled wickers bring to this countryside porch an effortless gray palette. Love the fusion of textiles in a soft palette of orange and rose that add extra intensity. This set of refined tufted chairs in pale hue and gothic arch backdrop proves that ”rustic” does not always mean rough and unrefined. The potted plants in various height give this decor extra texture. Even the porches with limited space offer a homey shelter when given organic colors and pieces of furniture balanced to fit. 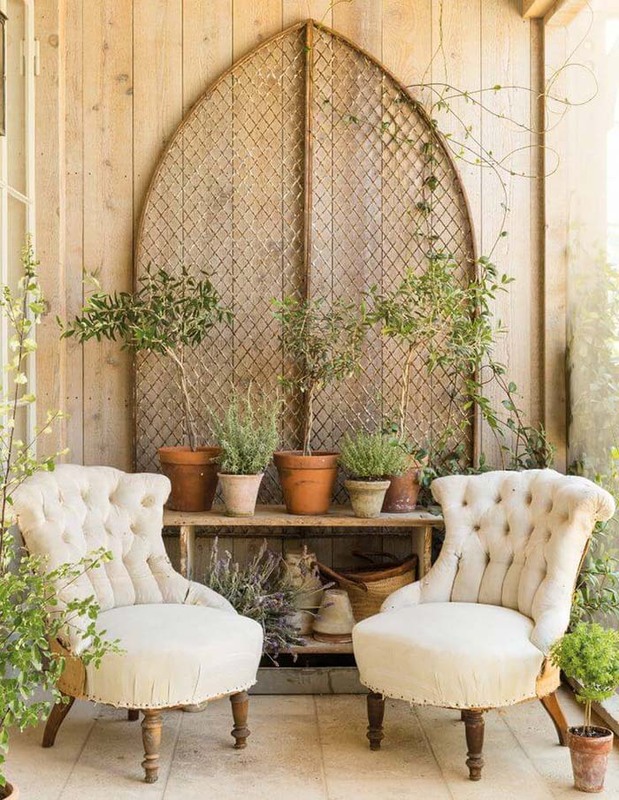 A pair of folding chairs, rustically chic walk art and tiny potted plants ideally pairs in this comfortably sheltered space. These shaker style wooden rockers are traditional farmhouse decor elements. The combination of wood and potted greenery is a symbol of natural elegance, simplicity and rural charm. 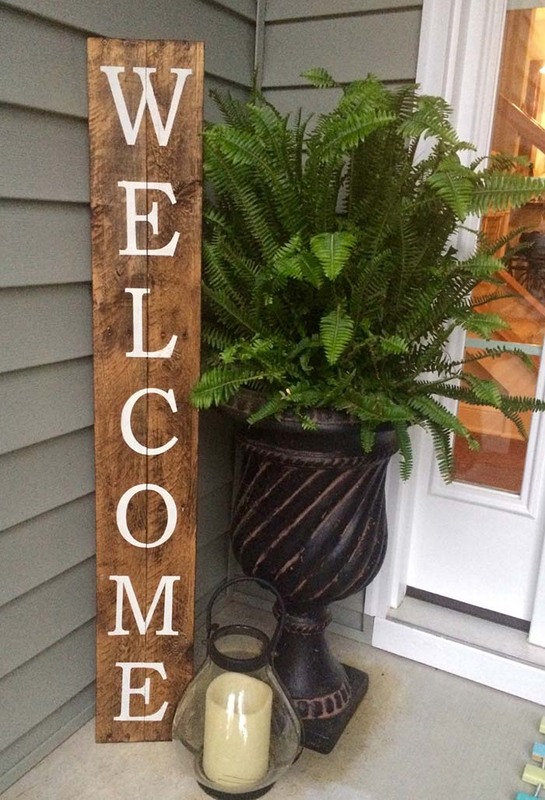 A rustic style front door floor mat saying “hello” is a classic way to make your guests feel welcoming and cozy. Bring some texture to the space by displaying potted plants in various heights. The gentle, pale branches and glassy hanging spheres lend a spacious, airy feel to this white-painted countryside entryway. The potted spring flowers add extra warmth and cheer to this setting. I decided to finish this rich collection of rustic front porch decorating ideas with a creative art wall. Why don’t you fix a pair of old tennis rackets on the wall to give the entryway space a unique touch? 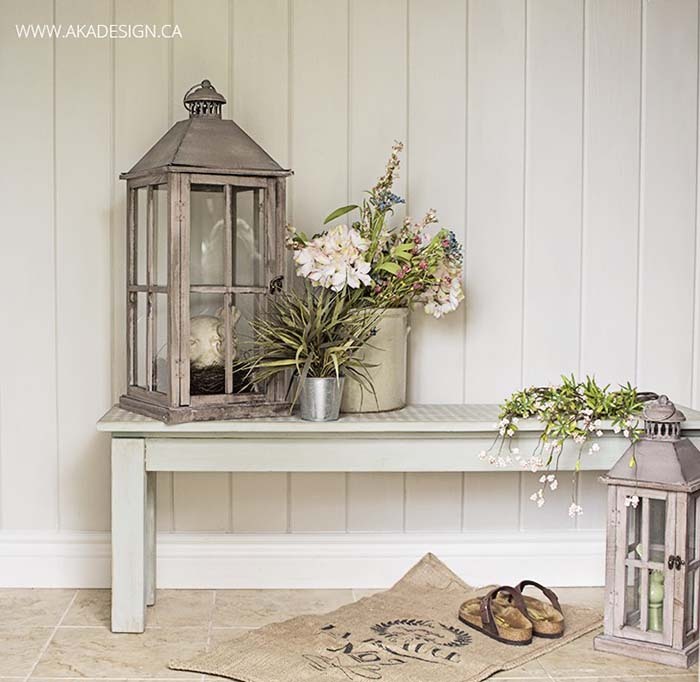 Did you like the all-natural elegance of the rustic style entryways? Did you find what you were looking for? 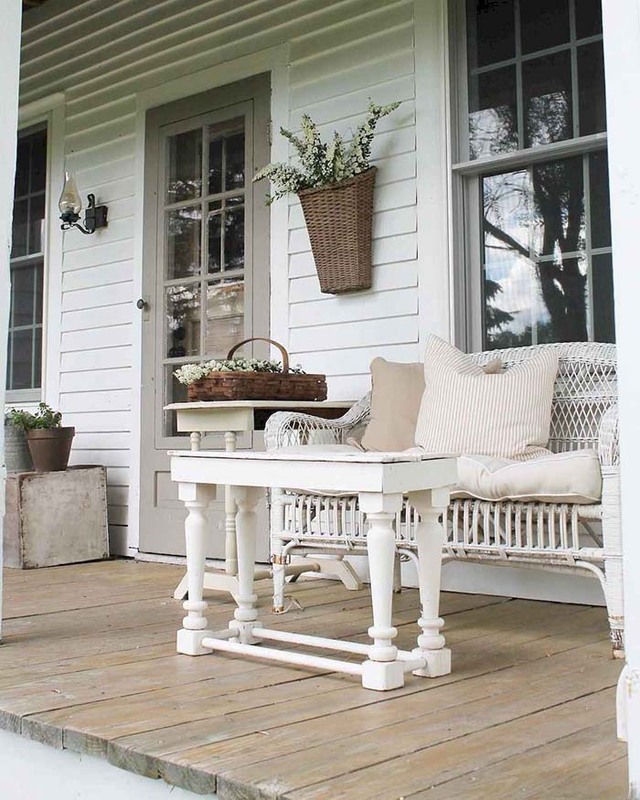 Timeless, homey, and simple are just a few words to define the porch in farmhouse style.